Wendy Whelan and Brian Brooks. Photo: Nir Arieli. Since her 2014 retirement from New York City Ballet, Wendy Whelan has kept consistently busy exploring genres outside of the genre of classical ballet, which made her a beloved star there for decades. One of the first projects she pursued was Restless Creature (2013), in which four male choreographers created pieces with her. It was intriguing, but she was still a Ballerina, for whom to design reverential and mostly careful movement. One of those was Brian Brooks, and the two perform Some of a Thousand Words at the Joyce, a five-part work plus musical interlude, with live music (by five composers) played by the string quartet Brooklyn Rider. From the outset of the evening, it's clear that Brooks has worked extensively with Whelan on neutralizing her innately lyrical line and comportment, which were honed and developed expansively over her 30 years with NYCB. At the start, the two walk slowly downstage. Of a similar height, wearing tank tops and pants, and with Whelan's hair pulled back tightly, they almost look like mirror images. The movement becomes bigger—deep second positions, pivots, tilting torsos, slashing arms. The phrases form a kind of serialism reminiscent of choreography by Anne Teresa De Keersmaeker or Lucinda Childs. In the next section, the pace quickens and the dancing is more darting and pond-skimming. 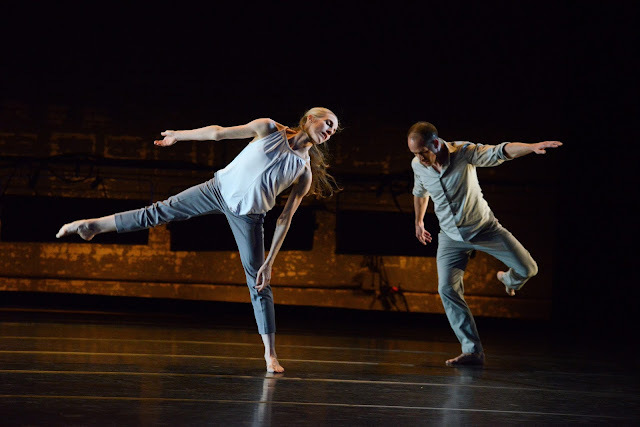 Whelan has a solo that is sinuous, fluid, organic, lifting a pointed foot and snaking her body. Brooks brings two chairs onstage. They each stand atop a chair, and Whelan slowly tips to the side while Brooks stealthily rushes to catch her atop his shoulders. It's a fancy trust fall, and the timing is impressively synchronized. They sit on the chairs and tip to one side, evoking a kneeplay from Einstein on the Beach (more Childs). Still seated, they perform a passage of arms and upper body moves and poses that recall Brooks' Bolero, in which his dancers perform the entire work with their feet planted, using only their upper bodies. Brooks has always explored movement ideas like a mad scientist, taking an idea to its physical limits and sometimes beyond. It's hard not to watch Whelan, whose luminous presence and clarity of line have always distinguished her onstage, but actually Brooks draws the eye equally. His everyman appearance and humble bearing don't demand our attention, but he has a lush muscularity and physical intelligence, and creates movement that complements these factors. The final section, which incorporates parts of his duet for Restless Creatures, feels as if it was made early in their working relationship, when reverence for her illustrious ballet career was at a high. She comes across as more fragile, a falling angel now in white (her body in a cruciform, no less) to catch softly on his back time and again. It's good to have seen in earlier sections that their partnership has brought her back down to earth and alongside a partner who is inspired by her, and vice versa, feet planted firmly on the ground.